The Felix task chair combines comfort, aesthetic styling and functionality. 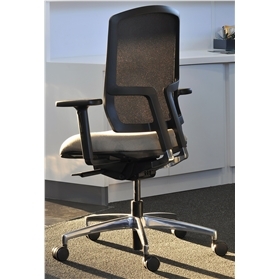 It delivers an encased height adjustable mesh-back which provides maximum flexibility. A new weight adjustment mechanism ensures a comfortable day sitting. The combination of a highly durable plastic and polished aluminium J bar ensures the smoothest height adjustment for the user. For your seat upholstery choose either the Xtreme Recycled Polyester fabric or Oxygen Premium 90% Pure New Wool fabric both available in many colours. Or treat yourself to sumptuous Shelly leather!